ADJ is pleased to announce the release of its new myDMX-RM lighting control interface that not only acts as a hardware dongle for the myDMX 3.0 software but also offers internal storage with 16 programmable trigger buttons. This makes the unit ideal for use in a wide variety of situations where simple, standalone lighting control is required. 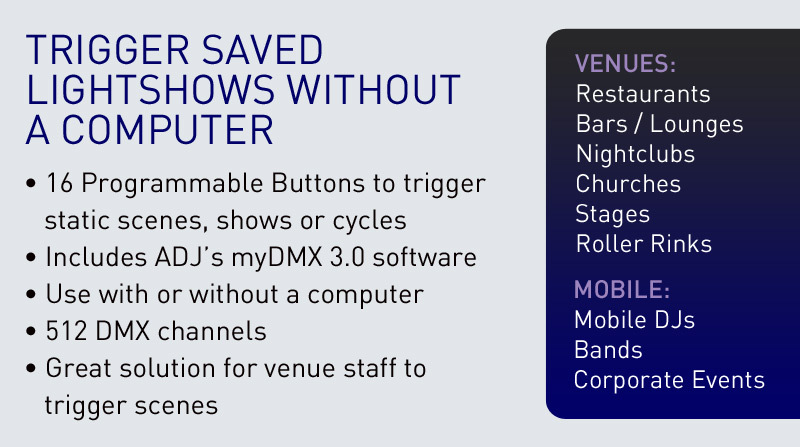 myDMX is ADJ’s extremely popular multi-platform DMX control software / hardware system (Windows and Mac OSX compatible) that offers an easy-to-use interface, powerful features and an affordable price tag. Featuring a large library of fixture profiles – as well as a custom Profile Editor – it is easy to setup myDMX to control any DMX-compatible lighting or effects equipment. An intuitive interface and powerful features (including a drag-and-drop effects generator) then make programming and controlling complex shows a breeze, while the latest version of the software – 3.0 – also includes additional useful features such as Blind Editing (the ability to change scenes without outputting DMX) and the option to playback multiple scenes at a time. Finally, the myDMX-RM can also be used by lighting designers and operators to provide a level of backup against a computer crash. When controlling a rig from myDMX through the myDMX-RM important scenes can be stored on the unit’s internal memory so that if the computer running the software crashes, or stop functioning for any reason, changes to the lightshow can still be made using the RM’s trigger buttons while the computer issue is resolved.